Holy Cannoli! We Built a Farmhouse Dining Room Table. 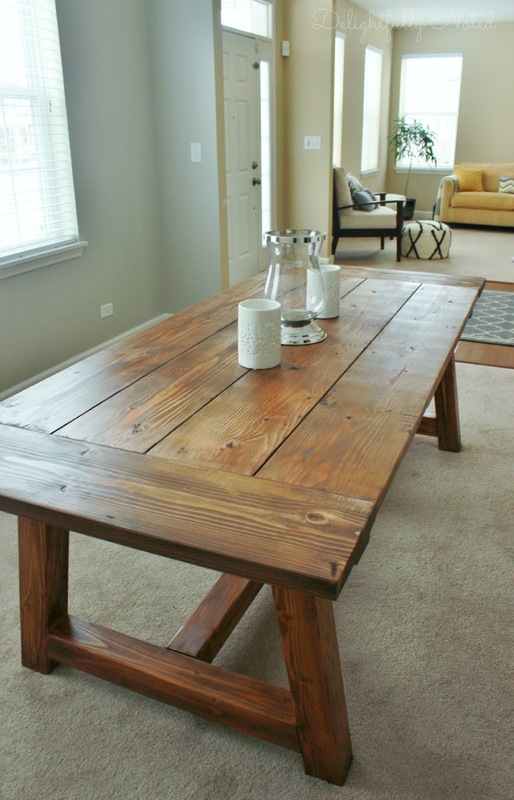 Remember that one time I built a farmhouse table? And by "I", I mean my husband. Yep, that's right, look who found a new home in my dining room; our new, rustic DIY Farmhouse table! Isn't she a beaut, Clark? I mean holy crap, we I built a table! I seriously can't stop staring at it. Well, maybe I'll hold off on the dancing part--after all, this was our first woodworking project. Needless to say, I can't get enough of this table. 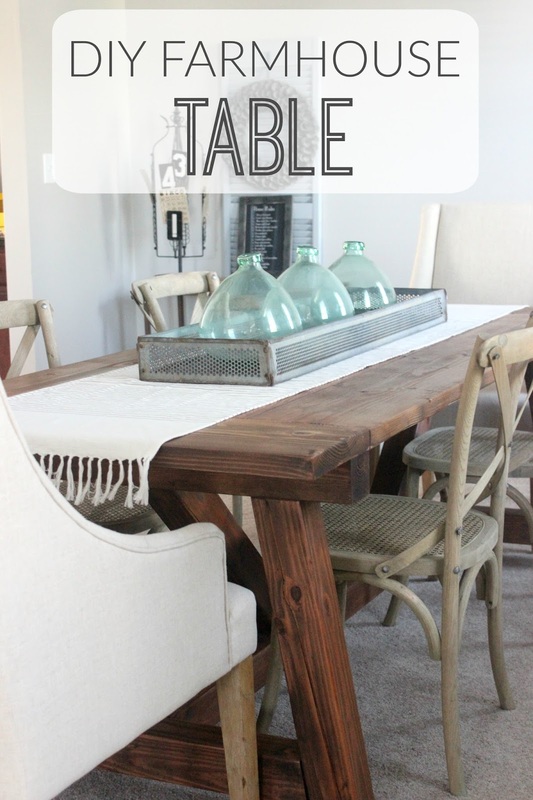 Adding a farmhouse table to our family has been on my to-do list for awhile now. The original plan was to create one to replace our kitchen table, which then led me to the idea a few weeks ago that we should build one for the dining room as "practice". We've never had a dining room before but I'm well aware this is the room everyone claims is useless 363 days out of the year. So my theory was if we messed up on the dining room table no one would see it, except for maybe 2 days a year. Unless of course, by "messed up" I meant it collapsed underneath the strain of our family and food at Christmas dinner--then I suppose that may be a problem.Fingers crossed that never happens, although that would make for a great story! Outside of a few tips I won't be sharing a play-by-play or tutorial. I'll just leave it up to the expert, Ms. Ana White. 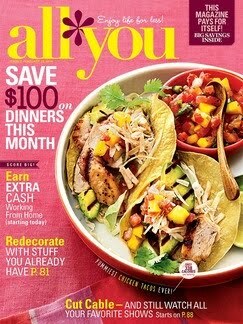 free full step-by-step plans over on the Ana White blog. As many of you may know, she has plans for everything under the sun, including a handful of different style farmhouse tables. 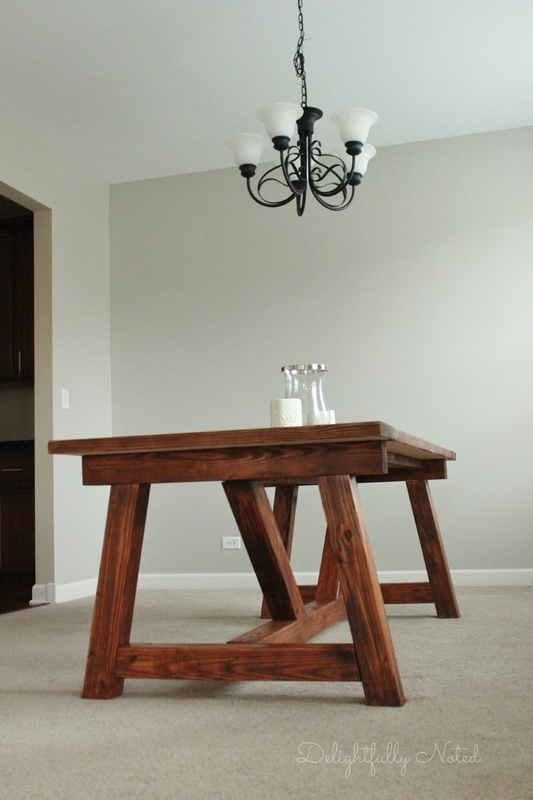 We ended up going with the truss beam table, a Restoration Hardware knockoff that goes for like a bajillion dollars. Here she is in her humble beginnings (excuse the night time phone pics). The hardest part of this project was finding the perfect stain color (says the one who never lifted a tool through out this process)! I'll spare you the drama, but let's just say I went through five cans of stain before I landed on one I liked. I don't have a lot of experience with stain and I failed to take into account that the color will look different depending on what type of wood you use. Rust-oleum's Dark Walnut , the same color used in the Ana White plans, ended up being the winner in the end. It's a beautiful rich color (it appears more red in pictures than in person)! 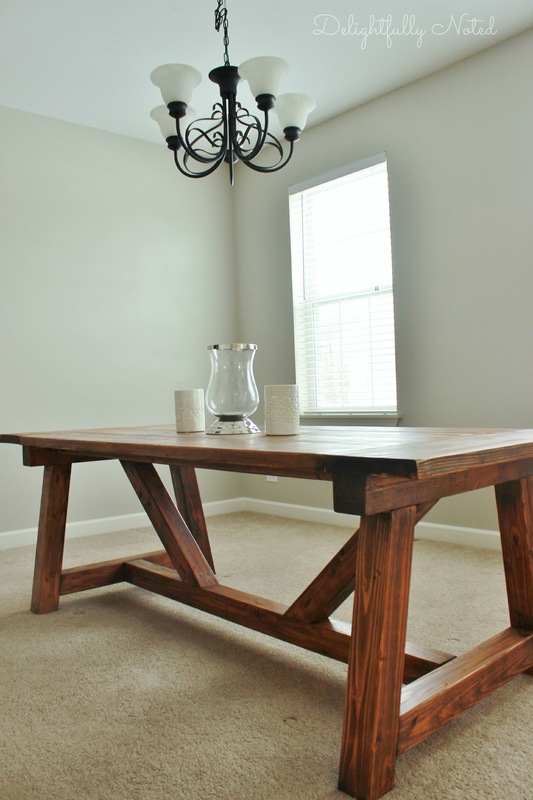 Thinking about building your own farmhouse table?Here's a few tips we learned along the way that may or may not be of help to you. 1. Ana White encourages you to read through the entire plan and all the comments before beginning your project. I second this, especially the comment sections. Questions that you feel were not addressed in the plans may be answered in the comments. In addition, some of the commenters have already built this table and may have suggestions you want to consider. 2. Cut all your wood first and then with a pencil lightly mark right on the wood the measurements and what piece it is. I promise this will cause less confusion later when you're going to put your table together! 4. Go with your gut when it comes to drilling your pocket holes(hidden drill holes that a screw sinks into at an angle to fasten two pieces of wood together). Where ever you feel your table needs to be more secured, then add a pocket hole. We drilled additional ones along the beams at the base for added security because Tarzan, I mean a 16 month old, lives here. 5. Speaking of pocket holes, take it from me--don't be sloppy with your wood filler! I was under the impression a lot of it would be sanded away before we stained our table so I got lazy, not the case. This caused an issue with the lighter stain color I originally had hoped for because the filled holes were still very visible. 6. Keep wood scraps for to use as stain samples. The biggest lesson I learned was that depending on what type of wood you use and the amount of time you allow the stain to sit, that your project most likely will not look the same color as the one on Pinterest. 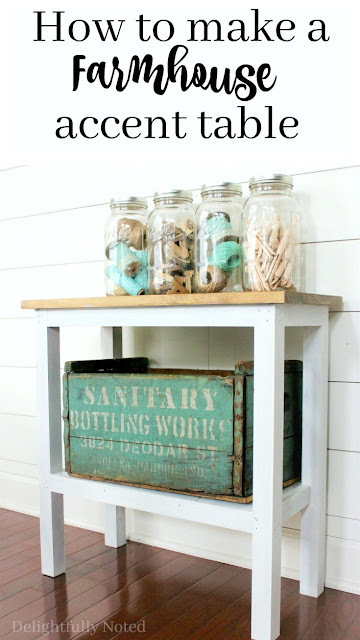 Test, test, test before you even think of staining your table! Now for the really fun part....chair shopping! farmhouse-style rooms, so that is the route I plan on going. Funny how the dining room in our new house has moved up from last on my priority list to first. I'm looking forward to putting this room together! If you'll excuse me now....I need to go pet my table some more. Catch all my home projects on Instagram! 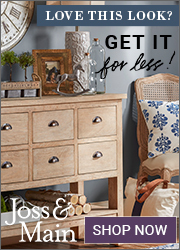 If you enjoyed this post, you may be interested in checking out our DIY farmhouse accent table we recently built! Looks really good, Jennifer! Great job! Wow! That is completely awesome! It's gorgeous! I would stare at it all day long! oh my gosh it is absolutely beautiful! what a labor of love indeed. absolutely love it. now can you come to California and make one for me?? Wow! You should be proud of that table girl!! You did a great job. I 'm a huge fan of Ana White but never had the nerve to try building one of her many great plans she shares! You rocked that table and, I would be sleeping on it or constantly staring at it!!! This looks great!!! You are a rockstar! I love Ana White's tutorials. I need to get on building a few things! You guys are awesome!!! I want a new table, it came out great! Oh goodness, I love it! 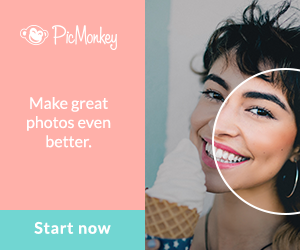 Thanks for linking up at Project Pin it! It's been been to the Project Pin-it board on Pinterest. Beautiful table. Your hubby is very talented. 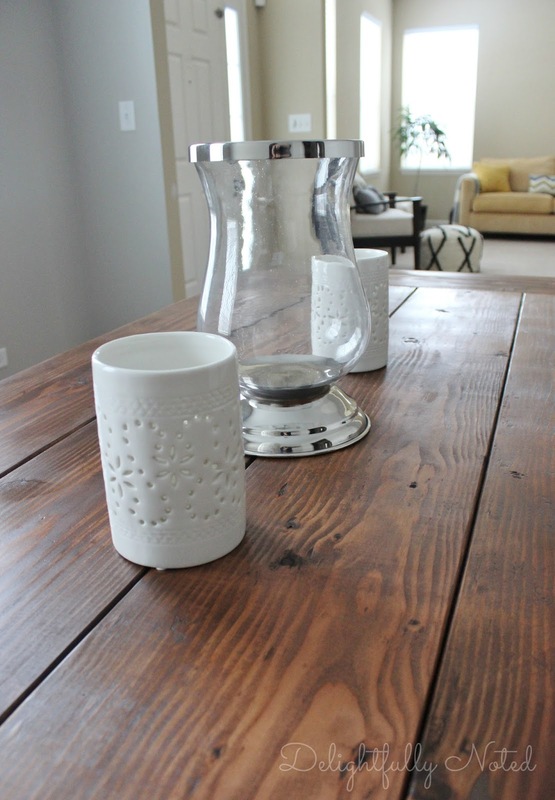 I love the color you chose for the stain & table style is awesome! ok, whoa. that looks amazing, i love the stain you chose and the base of the table. dance your socks off! What kind of wood did you end up going with? Love the table! Built one myself, i looked for chairs to match and had no luck, so I made my own! 2x4 & 1x4 only. I think they compliment nicely. Would love to share a pic, but I don't know how! Lol. Was the Kreg Jig R3 sufficient in this project? I can't wait to get started on my own.